The actual date of Dominic’s birth is not certain but what is most obvious is that he was born into a very religious family. His father was Felix Guzman who married his mother, Jane of Aza, in 1170.The cause of Felix’s canonisation was introduced and so he is called “Venerable Felix”. So also was the cause of Jane his wife. She is now known as “Blessed Jane of Aza” having been beatified. They went to live in Caleruega in central Spain. A brother Anthony was born the following year and it is thought that Dominic may have been born in 1172. Another son, Mannes was born later. All three boys became priests. Dominic was declared to be a saint. Mannes was beatified and is known as “Blessed Mannes”. 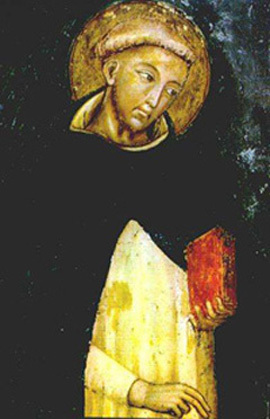 Anthony’s cause of sainthood was initiated and so he is called “Venerable Anthony”. When Dominic was about six or seven years of age he was given to a priest–uncle for his education in a time when there were no schools. When he was about nineteen or twenty years, he began theology for the priesthood. He was recognised as a great student who knew the Gospel of St. Matthew and the Epistles of St. Paul by heart. The prior or superior of the Canons Regular, a Church group in Osma near Calereuga, invited him to join them and he was ordained a priest in 1197, aged twenty–five years. This prior became bishop of the diocese and shortly afterwards was given the task to go to Denmark and negotiate a bride for the heir to the throne who was only thirteen and a half years of age. The new bishop invited Domini c to accompany him. While travelling through the south of France they met many heretics and once, when stopped at a hostel, Dominic spent the night with a deacon of the heresy and converted him. That changed Dominic’s life. He continued on the trip to Denmark. The bride agreed to the marriage. Two years later they returned to bring her to Spain but she did not go with them. On their return journey to Spain the bishop and Dominic stopped to become missionaries in the south of France. The bishop had to return to Osma where he died. Dominic was now on his own. In 1215 two priests joined him and gave him three houses. Dominic had seen that he needed help and so planned to found a religious group. 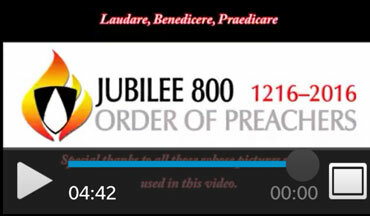 The Pope approved the “Order of Preachers” in December 1216. Within four year there were twelve or fifteen houses and at least thirty members. By 1221 there were five convents for nuns, many women who needed to be protected because they left the heretics and joined Dominic.